In the spring of 1996, right before my first trip to Africa, I participated in a “behind-the-scenes” tour at the Woodland Park Zoo in Seattle, Washington. During the tour, we were allowed into the close contact area of the elephant barn, an area separated from the zoo’s three elephants by strong metal bars. One by one, they were brought forward by their handler, and we fed them carrots from a 50-pound bag. One of the elephants, Chai, was extremely interested in my sister’s leather coat, gently squeezing it at the shoulder, inhaling each square inch down to my sister’s elbow, as if asking, What animal is this? My brother-in-law, who is huge by human standards, was especially fascinating in his leather coat. Sniff. Squeeze. And who are you? Trunk length from an elephant for the very first time, I was mesmerized by the meditative intelligence in her eyes. Chai rumbled, the sound reverberating throughout the barn. We hummed back at her, sang a low, wordless song, my brother-in-law’s voice especially deep and loud. She turned her head from side to side, as if trying to understand our oscillating meaning. Then the air around us condensed, washed over us in waves, pulsated just below our range of hearing. It was my first experience with infrasound, vibrations I could feel in my chest, vibrations my ears would never hear. Chai slowly stretched out her trunk to accept a carrot from my sister, stuffed it into her cheeks and then slowly reached out for another. When her cheeks were as stuffed as a chipmunk’s, her handler said, “Okay, that’s enough,” and tapped her alternately above each knee with an ankus, an elephant hook. She backed up, swinging her head from side to side. In 1980, when Chai was only a year old, she was separated from her mother and flown to Seattle by Thai Airways to commemorate the delivery of the first Boeing 747 to Thailand. She was only sixteen when I met her. Two years after our behind-the-scenes tour, Chai was shipped to Missouri to be bred to a bull named Onyx. By then several artificial insemination attempts had already failed to impregnate her. After three days and 2,100 miles in a truck, she arrived at the Dickerson Park Zoo. On the third day after her arrival, the Dickerson Zoo’s staff beat her for two-and-a-half hours because she would not respond to their commands. (The zoo was later fined $5000.) Chai lost 1,000 pounds in the twelve months she was in Missouri. Finally pregnant, she was trucked back to Seattle. Twenty-two months later, in 2000, she gave birth to a female calf. The naming contest for the new zoo resident gathered 16,000 entries. 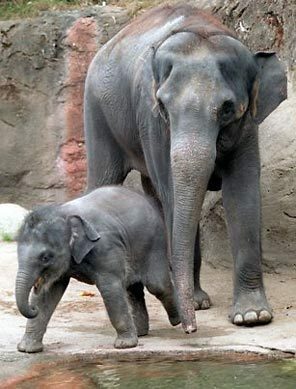 The Thai name selected, Hansa (pronounced HUN-suh), means “Extreme Happiness.” Once the calf was on view attendance at the zoo doubled and Chai proved to be a very capable mother. But in June of 2007, Hansa died, infected with a new strain of elephant herpes – a highly communicable virus that had already claimed the lives of forty percent of young Asian calves in zoos. Hansa made a lot of money for Woodland Park, so Chai has been artificially inseminated again and again – a total of 112 times – resulting in just one other pregnancy and the miscarriage of that calf. Day after day, Chai listens to hordes and choruses of unfamiliar human noises. She listens and moves slowly back and forth in her cage. Perhaps she mourns the loss of her Extreme Happiness. Perhaps after awhile it all blurs, like the background hum of an engine in flight. THere is a great place, PAWS, in Northern CA that rescues elephants from zoos and circuses. This elephant sounds like it’s time for her to be rescued. Shall we work on it? Hi Lori – there is an organization working toward freeing all of the Woodland Park Zoo elephants: http://www.freewpzelephants.com/ and they can certainly use all our support and help. Fortunately, the Seattle media often keeps this issue in front of its readers. Such a sad story about Chai – to be shipped here and there, and to lose her baby. Heart-breaking! We’re not sure animals should be contained in zoos so humans can look at them… Certainly the elephants we’ve seen in the wild in Africa behave very differently from ones in captivity. I am definitely convinced elephants should never be in zoos – that’s why I posted that entry on my blog. When you spend time with elephants in the wild, as we do and did, it’s so obvious that they belong free. Hope you had a chance to check out some of my other posts . . . you’d have an amazing elephant experience, as I do, with the elephants at LivingWithElephants.org. Happy Trails – looking forward to reading more about your adventures. PETA is calling on Dickerson Park Zoo in Springfield, Missouri, to shutter its deadly and cruel elephant exhibit after an elephant attack this morning left senior zookeeper John Bradford dead. It’s no surprise that the elephant, Patience, lashed out after years of stress-inducing, unnatural imprisonment. Patience had been taken from her family when she was captured from the wild. She was shipped to the U.S. and then moved from zoo to zoo. She is now confined to a tiny 1.5-acre enclosure, unable to travel more than a few yards, let alone the 30 miles a day that she might have walked with her mother, aunts, and other family members, had she not been kidnapped from her home and deprived of their company. Not only did Patience have her freedom taken from her, her son was also stolen from her when he was only 18 months old. Elephants are sensitive and careful mothers, nursing their children until they are at least 5 years old. Males stay with their mothers until they reach adolescence, and females stay with their mothers for life. Patience doesn’t know that her baby died six months after being shipped off to Six Flags. Bradford’s death was wholly preventable, had the zoo left Patience with her herd as nature intended. It also would not have occurred if the zoo had handled Patience only in protected contact—the safer, more humane management system used by all reputable sanctuaries and zoos. PETA is calling on the USDA and the Occupational Safety and Health Administration to investigate the incident. Again, you have made me cry. When your book is published I hope that the tears you loose everywhere will channel together into a force to protect the elephants. And humans consider our species to be the most intelligent? Ah, but intelligence is not wisdom. hearbreaking – I hope those abusive staff at Dickerson Zoo rot in hell – this sort of horror story just tears me apart – Elephants are such highly evolved wise creatures, deserving of a life of freedom and kinship – What can done for Chai now? Motria – A study was commissioned and was released this October concerning what to do with the elephant exhibit at the Woodland Park Zoo. The findings were twofold: 1. Do nothing. 2. Expand the exhibit significantly and add more elephants. Currently, Chai is in good health. But her future is uncertain. Motria – If you could condense and remove the repetitive information in your second response, I would love to post it to this website because of the useful information that it contains. Thanks! A poignant story beautifully written, Cheryl. So very sad. My heart aches for Chai and all elephants who suffer while living unnatural lives in captivity. Thank you Patty. There are zoos and sanctuaries that take good care of their elephants, as you well know. But you have also known elephants in the wild, and know that difference, too. Hope you and Mr. K have a great week.